1. Milk for baby monarchs. 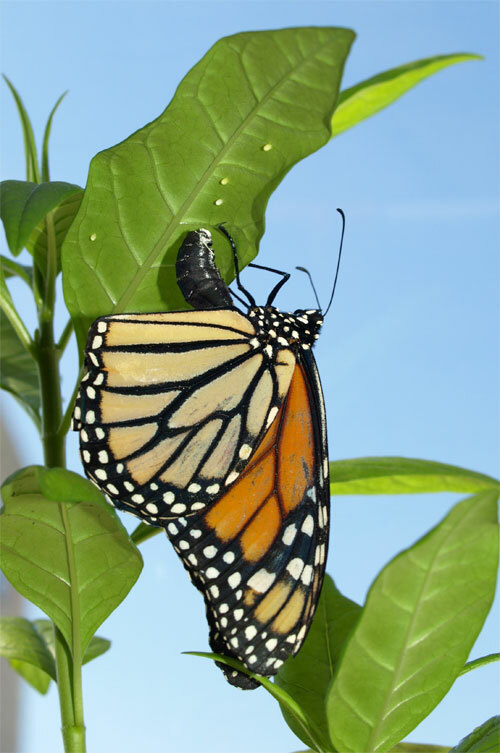 Asclepias or milkweed is the only plant on which the female monarch will lay her eggs. The milkweed not only provides sustenance for the larvae, it provides them with protection, making the butterflies taste foul to birds and other predators. It also makes them poisonous. 2. The Wanderer, Danaus Plexippus. The monarch is the best known butterfly in North America, renowned for its migratory habits which can take it from Canada to Mexico and Baja, California where millions of butterflies, born in August, rush to spend the winter. But it has also migrated elsewhere and in1871, it was found in Australia where it is called the Wanderer. It has also travelled to the Canary Islands, the Azores and Madeira and the occasional stray shows up in Europe and the United Kingdom and even in Hawaii. 3. Light weights make heavy burdens. 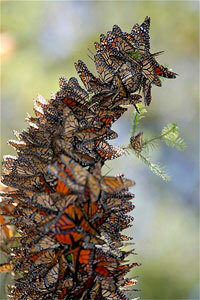 The migrating monarch, when she gets to Mexico, sleeps in the winter in the branches of fir trees. Sometimes the burden of all those sleeping beauties becomes so great that the branch breaks. 4. A beautiful but brief life. The monarch lives just two months, except when it is overwintering down south when it enters a state called diapause which can carry it through for seven months or even more. 5. Go north young butterfly, go north. 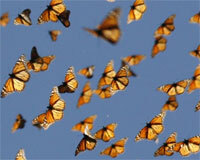 Just as late-birthing butterflies go south in winter, in spring, a batch flies north to Canada. However, this is more of a relay journey than a nonstop flight by a single butterfly. Along the journey, the female lays eggs, which hatch in just four days, for another generation which will continue the trip. It takes as many as four generations to get to the original locations in Canada or the northern United States, but nobody knows how the fourth generation offspring know where to go. Scientists believe that the butterflies have an inherited circadian clock that resides in their antennae. This, they believe, may allow the butterflies to orient themselves to the position of the sun in the sky which is somehow tied to information they glean from the magnetic poles. There is something called cryptochrome in those super antennae, that apparently is sensitive to the violet-blue part of the spectrum. The cryptochrome functions as a chemical compass, which can detect a pole, although not whether it is north or south. Hmmm. Seems like the scientists still have some work to do. 7. How orange is my wingspan. 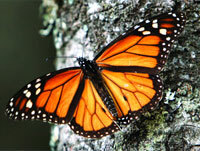 Migrating butterflies have been discovered to be more intensely orange that those who are stay at home breeders. Could this have something to do with their navigational skills? 8. Food fit for a monarch. 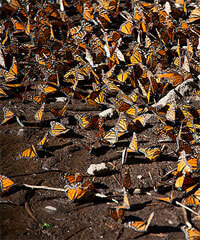 Monarchs can sometimes be seen wallowing in mud puddles. They are not demonstrating piggy-like behaviour, they are looking for moisture and minerals both. Clever. 10. More than just babies here. Mating is both aerial and on the ground. When the male injects his sperms, it is believed that he is passing on more than just fertilizer for the egg. The spermatophore that is transferred contains an energy resource to help the female get through both reproduction and migration. Posted on February 26, 2014 December 10, 2018 by savethemonarchTagged antennae, Asclepias, butterflies, Canada, chemical compass, circadian clock, cryptochrome, Danaus Plexippus, diapause, migrating butterflies, milkweed, Monarch, monarch butterfly, North America, pollinators, save the monarch, spermatophore, the Wanderer. The Monarch butterfly, symbol of all that is beautiful, including the détente between Canada, the United States and Mexico, is under threat. Where a few years ago, in 1996, the monarchs were so numerous the branches of the fir trees in Mexico’s Oyamel Forest Reserve broke under the weight of 350 million butterflies, this year, that number has fallen to fewer than 33.5 million. In 1996, they thickly covered a 44-plus hectare area in the Forest Reserve. Last year they scantly covered 1.19 hectares and the latest reports shows that this area has been reduced again to just .67 hectares. The reasons? Weather has played a part, but the overriding culprit is the spraying of genetically modified crops that are bred to withstand he chemical pesticide. glyphosate. This has devastated the once naturally occurring milkweed that inhabits crop margins and road allowances. Only 40% of this once ubiquitous plant still exists. Milkweed is the only plant upon which the monarch butterflies will lay their eggs – it is the only plant upon which the caterpillars will feed. 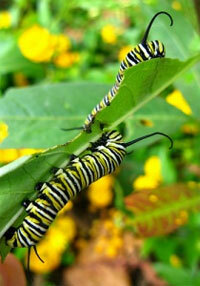 Without milkweed, the monarchs cannot survive. More, the spraying also affects the wildflowers that feed the adult butterflies with nectar to help them make their long journey each year. 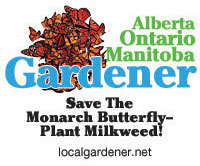 We cannot let this happen without a fight, so here at the Local Gardner magazines, we are waging a Save the Monarch Butterfly campaign, urging you to plant milkweed this spring.